Having written / produced/ edited more than 40 books out of which 7 are biographies, I can say with some authority that it is ultimately a gift. Saraswati truly has to bless, else it’s not doable. 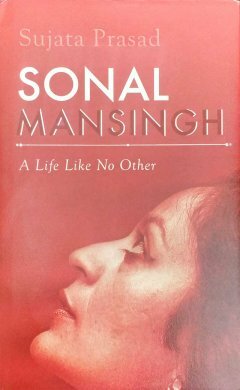 A Life like No Other....no, not mine but title and teeth (substance) of Sonal Mansingh’s biography written by a civil servant named Sujata Prasad is an unputdownable read. Sujata not knowing much about the dance field is actually a plus: Few biases, fewer prejudices. No camps or camouflaging. It’s an AS TOLD TO type of bio. And what a bio! Dancers act shy, coy, wishy-washy on surface. Under the surface, most are survivors, often cunning and occasionally smart. Some are truly talented too! But bold (and beautiful), not many. Sonal Mansingh is. This review makes me want to buy the book and that I shall do. The review itself is very interesting and makes one want to read the book.Sonal ji's dance and personality is dynamic and sets as an example for present day women empowerment as Ashish ji rightly said. The best biography / autobiography of a dancer I have read are - Ram Gopal, Indrani Rehman, Protima Bedi, Mrinalini Sarabhai... Must read. Nice review, Accentuated nicely, with lots of punches also, going together with his style. I am just going to buy this book. I am an admirer of Sonal ji and also of writings of Mojan ji. She came many times to IITKanpur thus I came to know her better.